Important note - the Portsdown transmitter has been designed to "work out of the box" but you do have to run through the initial set up procedure described on this page. Once you have a RPi and an SD card with the Portsdown firmware installed - either from the BATC shop or by following the instructions in this section of the user guide - the system must be initially setup. If your SD Card is loaded with Software after 201804010, and you have a Waveshare touchscreen, you can do nearly all the setup from the touchscreen. The only items that require the procedure below are setting up the WiFi, entering streaming account details, setting up the hardware shutdown button and changing the Display type. If you need to change any of these details, or you have an older SD Card image, you need to configure your Portsdown using an external PC connected to the RP over your standard home network. Using a network lead (not wifi at this stage), connect the RPi to the same network as your PC, install the SD card and turn the RPi on (you do not need a keyboard, mouse or monitor connected to the Rpi). If you are using Portsdown software 201704160 or later and have a touchscreen fitted your RPi's IP address should appear on the touchscreen 20 seconds after power-on. If you have an older software version or no touchscreen, you will need to run the IP Scanner program on your PC - download it from Advanced IP Scanner and scan for devices and after a few seconds it will list all the devices on your network including one from the Raspberry Pi foundation - this is your RPi so note down the IP address listed against it. You can now close the IP scanner program. Now you need to log on to your RPi using a PC over your home network (Do NOT connect a keyboard and monitor directly to the RPi). To do this you need to download an SSH Terminal application such as Putty to edit the set up menu - make sure you use a recent version of putty or it may reject the RPi security certificate. There is a video on the BATC YouTube channel showing how to do these processes - please watch it before posting any questions on the forum, but note you may NOT need to do the first step (finding the IP address). Connect your touchscreen and any other peripherals such Pi camera and audio dongle but do not connect a monitor or keyboard to the Raspberry Pi. 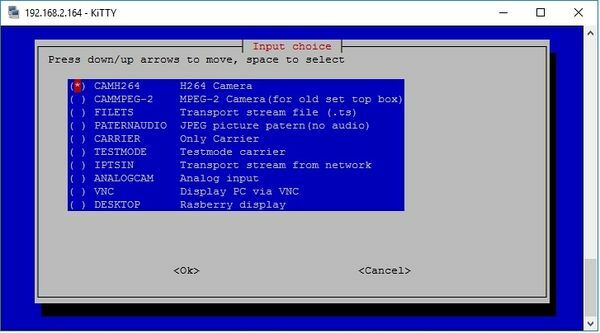 You now need to set up your Portsdown using the Console Menu - remember these instructions as you made need them to change configurations in the future. Open Putty or another SSH terminal program, enter the IP address of your RPi and open a connection. The first time that you do this, you will get a security warning; accept it. At the logon prompt enter the default username of "pi" and the password "raspberry". The Portsdown console menu will start automatically, and you should see the following screen on the PC: At the same time, a BATC logo should appear on the touchscreen. If there is nothing on the touchscreen, try a shutdown, power-off and re-start. Note - in the menus press the up and down PC keyboard arrows to highlight the item that you require and then the space bar to select it (don’t forget this!). Then press Enter to make the changes and return to the main menu. Source Press the down arrow once and then Enter to select the “Source” menu and select the input you are using. Output Select the “Output” menu and configure the following options. Output Symbol Rate. 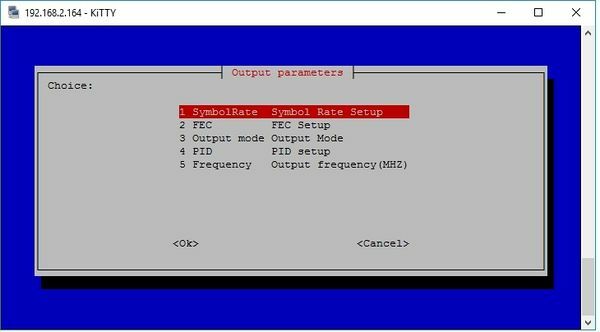 Select the “Output” menu and then Symbol Rate. Enter the symbol rate in KS/s. Some sources and output modes do not work at high symbol rate – this is one of the first parameters to change if you are having problems, particularly in QPSKRF or "ugly" mode. Output FEC. The default FEC is 7/8 – you can change this is if you want. Output Mode. Again select the desired option using the space bar. Currently, only IQ (using the default pin selections for the BATC Portsdown modulator and filter board) and QPSKRF at an RF gain of 7 (for testing with an “ugly” signal directly from pin 32) are actively supported. Output PID. Set the PID PMT to 255. This will ensure that the video PID is 256 – the BATC standard. Output Frequency. Set the output frequency for your ADF4351 synthesizer here. If you are using QPSKRF “ugly” mode, set to 437 MHz only. Once you have set the output parameters, go back to the main menu. Station. In the station menu, you can set your call and locator. The callsign is used to identify the digital transmission, and the callsign and locator are used in the test card overlay. System Setup Autostart. You can select how you want your RPi to start up. The first 4 options require you to log-in using a console before anything happens, whereas the last 3 do not require a console. 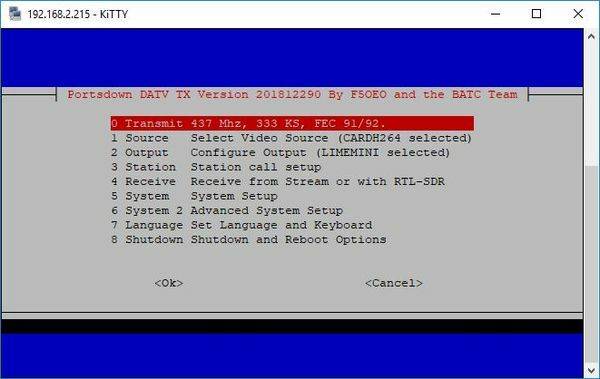 TX_boot starts transmitting at power-on, so does not even require a touchscreen. If you want to only use the touchscreen display select Display_boot and the system will always start up using the touchscreen only. System Setup Additions. It is hoped to add other options in the System Setup menu as the software is developed. Language. The menu language can be changed to French or German (or back to English) from this menu. Your Portsdown transmitter is now set up and ready for use but will require a reboot for the configuration to take effect so go into the Shutdown menu and select Reboot. The Portsdown will now restart in whichever mode you set in the System Setup Autostart menu. Please refer to the appropriate section of the Portsdown Transmitter user guide for console or touch screen operation. This page was last modified on 7 April 2018, at 21:06.